The field of humanitarianism is characterised by profound uncertainty, by a constant need to respond to the unpredictable, and by concepts and practices that often defy simple or straightforward explanation. Humanitarians often find themselves not just engaged in the pursuit of effective action, but also in a quest for meaning. That is the starting point for this book. Humanitarian action has in recent years confronted geopolitical challenges that have upended much of its conventional modus operandi and presented threats to its foundational assumptions and legal frameworks. The critical interrogation of the purpose, practice and future of humanitarian action has yielded a rich new field of enquiry, humanitarian studies, and many thoughtful books, articles and reports. So, the question arose as to the most useful way to provide a critical overview that might serve to bring some definitional clarity as well as analytical rigor to the waves of critique and shifting sands of humanitarian action. 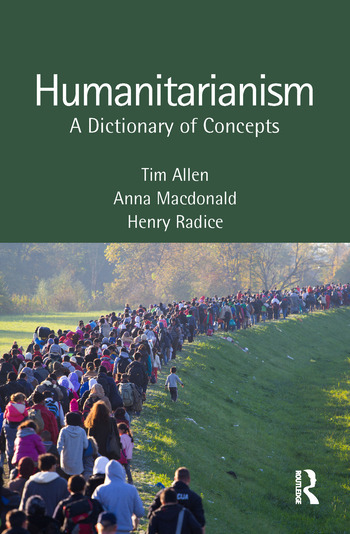 Humanitarianism: A Dictionary of Concepts provides an authoritative analysis that attempts to rethink, rather than merely problematize or define the issues at stake in contemporary humanitarian debates. It is an important moment to do so. Just about every tenet of humanitarianism is currently open to question as never before. Tim Allen is a Professor of Development Anthropology, Fellow of the Academy of Social Sciences, and Director of the Firoz Lalji Centre for Africa at the London School of Economics and Political Science (LSE). He works at the intersections of accountability, criminal justice, social healing, health care, international development and humanitarian assistance. He has conducted research on the Uganda/South Sudan border since the 1980s as well as on Botswana, Tanzania, Kenya and Ghana. Much of his work has focused on issues of humanitarian crisis, including mass forced displacement, armed conflict and the ways in which populations manage in extreme circumstances. In 2016 he launched the Centre for Public Authority in International Development, which explores how families, clans, religious leaders, aid agencies, civil society, rebel militia and vigilante groups contribute to governance, along with formal and semi-formal government institutions. Anna Macdonald is a Research Fellow in the International Development Department at the London School of Economics and Political Science (LSE). Her research focuses on the politics of transitional justice and humanitarian intervention, and ideas about law and social order in Central Africa. Henry Radice is a Research Fellow at the London School of Economics and Political Science (LSE), based on the Conflict Research Programme in the Department of International Development. His work delineates the category of humanitarianism within international political theory, exploring the ethics and politics of humanitarian action and focusing on key notions such as common humanity, human suffering, rescue, solidarity and internationalism. He holds a PhD in International Relations from the LSE.